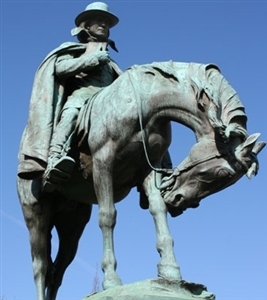 Francis Asbury's contributions are memorialized in a monument in Washington, D.C.
As American Methodists celebrate their nation's founding with parades, parties and fireworks, some might ponder how a denomination born in England managed to take root during a time of turbulence and rebellion in colonial America. Francis Asbury, a Methodist preacher who would later become a bishop, began his ministry in Philadelphia in 1771, responding to a request for ministers to go to America from John Wesley himself. Asbury continued to preach and make disciples of Christ as the mission field around him struggled for independence and grew into a young nation. "During the Revolutionary War, Asbury remained politically neutral. To avoid signing an oath disclaiming his allegiance to England and to dodge the American draft, he went into hiding for several months. 'I am considered by some as an enemy,' he wrote, 'liable to be seized by violence and abused.' By war's end, he had retained his credibility with the victorious Americans and was able to continue his ministry among them."